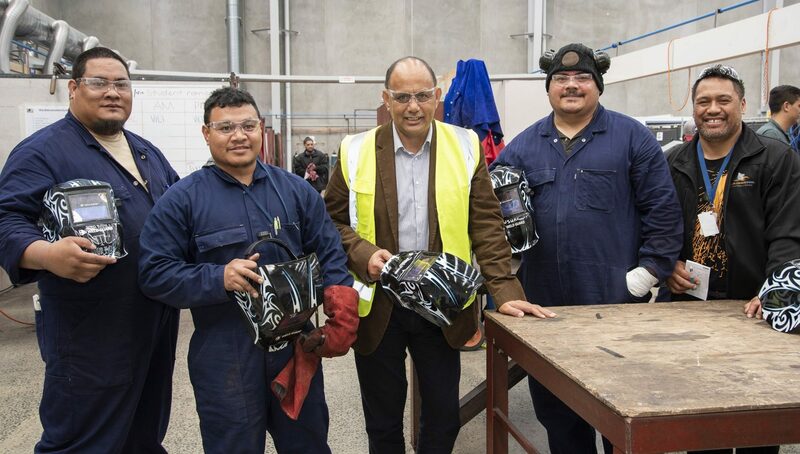 Yesterday marked the beginning of an exciting new chapter for 73 of Auckland’s freshest tradies – and the first birthday of Wiri-based trades training school, Aspire2 Trades. Aspiring forklift drivers, painters, welders and infrastructure workers packed out the Aspire2 Trades campus last night, celebrating their successful graduation from a range of Level 2, 3 and 4 trades programmes. Now poised to forge successful careers in the industry, graduates were treated to not only the recognition they deserved, but also plenty of inspiration. Guest speaker John Clark shared his personal journey – a transformation from violence and time behind bars, to the success he currently enjoys as a respected foreman at Fulton Hogan. He encouraged graduates to keep learning and keep striving to be the best they could be. “I am not proud of what I did in my past, but I had to learn to let that go in order to become the man I am now,” he said. John said the Solomon Group had been pivotal in his success, supporting him through his Infrastructure Trades studies so that he could achieve his qualifications and find a great job. 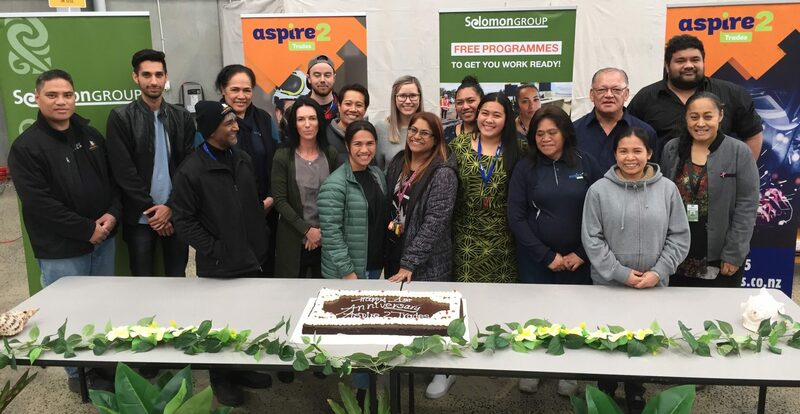 Last night was the first time the Solomon Group has been part of a graduation ceremony at Aspire2 Trades, and Brand and Content Manager Soteria Fetalaiga (Sote) said the occasion marked the start of a new partnership between the two education providers. Graduating students were clearly delighted at their achievements and were well supported by cheers and claps from tutors, classmates, whanau and friends. Eighteen year old Narea Anderson graduated with her Level 3 and 4 welding qualifications and already has a good job as a MIG welder for Merton Equipment. “At first I was a bit worried about studying welding because it’s a very male dominated industry but the guys here are cool – everyone motivates each other and supports each other, and the tutors are awesome,” she said. Narea’s brother Creed was also graduating with his Level 3 welding qualification and has been snapped up by the same employer. “I really enjoyed the course, love my job and feel really proud of what I have achieved,” he added. Aspire2 Trades, owned by Aspire2 Group Limited are committed to creating courses and programmes that will deliver measurable, practical skills for our students that create future opportunities. We want to ensure our students are employable and are employed – and are committed to this through our Aspire2 Work service. New Zealand Welding School and Cornerstone Education are NZQA registered PTEs which are a part of Aspire2 Group Limited.